1 of 10 Heat oven to 350 degrees F. Grease and flour three 8-inch round layer-cake pans, tapping out excess flour. 2 of 10 Prepare cake mix according to package directions. Divide evenly into the 3 prepared pans. 3 of 10 Bake in 350 degrees F oven according to package directions, but only for 25 to 30 minutes or until tops spring back when pressed lightly with fingertip. Cool according to package directions. Set all three layers, top side up, on cooling racks. 4 of 10 Prepare 2 recipes Fluffy Frosting. Spoon 1/2 cup into each of 3 small bowls. Color one light orange, to resemble cheese. Color another with liquid red and yellow colorings to resemble pale peach-colored Russian dressing. Fold in nuts. Color third batch with red paste coloring to resemble tomato. 5 of 10 Spoon 1-1/2 cups white frosting into bowl. Set aside 2 tablespoons cocoa powder. Stir remaining 2/3 cup cocoa powder and 2 tablespoons warm water into frosting until smooth to make dark-brown frosting for hamburgers. Stir reserved 2 tablespoons cocoa and instant coffee into 1 tablespoon warm water; add to remaining white frosting to make light-brown frosting for buns. 6 of 10 Knead several drops of green and 1 drop of yellow food coloring into almond paste. Divide into 12 pieces. Roll out pieces between waxed paper to form uneven shapes resembling lettuce leaves. 7 of 10 Frost halfway up side of first cake layer with light-brown frosting for bun. Place layer, frosted side down, on cake plate. Thickly frost top half of side of layer with a little less than half the dark-brown frosting. Round the edges and roughen with fork to resemble hamburger. Frost top of layer with dark-brown frosting. 8 of 10 Spoon orange frosting on top of layer. Spread with spatula to cover top and extend over sides at places to resemble melted cheese. Top with 6 almond paste lettuce leaves. 9 of 10 Turn second cake layer over on cooling rack. Frost bottom (now facing up) and halfway down sides with light-brown frosting for bun. Place, frosted side down, on top of almond paste leaves on first layer. 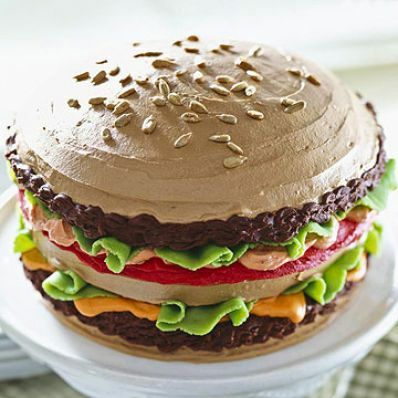 To make tomato, spread thin layer of red frosting with spatula around unfrosted top half of layer and over top of cake. 10 of 10 Spoon all of the Russian dressing frosting over the red frosting. Spread to cover the top of the layer, and extend part way down the sides to resemble dressing. Top with remaining 6 almond paste lettuce leaves. Per Serving: 5 g sat. fat, 19 mg chol., 26 g Fat, total, 83 g carb., 167 mg sodium, 4 g fiber, 5 g pro., 570 kcal cal.